Please feel free to leave any questions you have concerning Siamese, Oriental, LaPerm, Cornish or Devon breeds of cats, on our message forum. Queries about other breeds and domestic cats welcome. Justfelineshmm is a friendly, Oriental, Siamese, LaPerm, Cornish and Devon Rex Cat Orientated Mailing Group. Supreme Gr Ch Closlucile Holdup, OSH b 03. The 2 photos above show Holdup at 14+ years of age and 4 months. More information can be found at justfelineshmm@yahoogroups.com" why not come along and join us? Justfelineshmm - here you can relax and chat Cat with friends. Justfelineshmm - welcomes you to relax and chat Cat with other like minded people. We have breeders and owners from the UK and other countries as members, with a common love and interest of all things cats. Come and join in light hearted plus deeper discussions about our feline friends. Our aim, is to discuss all issues relating to the showing, breeding, genes, outcrossing, health and welfare of Oriental and Rex coated cats - plus fun and joy of Pet ownership, and cat equipment. Pet owners, breeders and exhibitors of other breeds of cats are welcome. 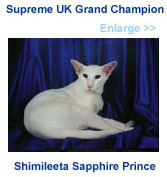 Photos of Oriental, Siamese, Rex coated cats, Asians and other pedigree breeds. Full expression colour Chocolate Smoke. 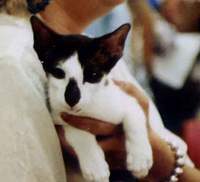 BSH can be used in Cornish and Devon Rex outcrossing. This month it is the turn of the Foreign White! 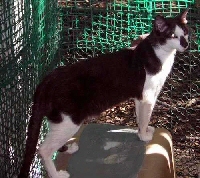 Pedigree kittens for sale, updated photos of kittens. Justfelineshmm is a Pedigree cat orientated Mailing Group and Web Site for members. Topics covers General Health Issues, Breeding and Showing of pedigree cats. 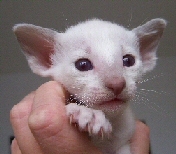 Our Web Site is where members advertise their pedigree kittens for sale, and stud service. Inside our web site you will find plenty to interest you, such as Breed Profiles and photographs of the different breeds of cats and kittens. Owners, Breeders and Pet owners are welcome to join us, and join in our discussions. Also to join our sister group, jfhphotogallery, and post and view photos of our beautiful cats and kittens. Novice Breeders are welcome, especially those who are looking for help and advice, on their relevant breeds. Listed inside are members'Stud Cats, and kittens for sale.